The Protergia Business products are addressed to commercial and industrial Low and Medium Voltage customers. They have been designed with a view to reducing the power supply costs of your business and thus help you reduce operating expenses. Select the product that matches the particular needs of your business to see more details about pricing and other product features. Protergia Business 1 and Protergia Business 1B are addressed to low voltage professionals with an installed capacity up to 25 kVA. 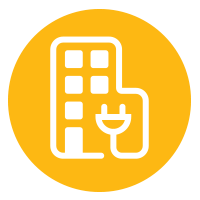 Protergia Business 2 and Protergia Business 2B are addressed to low voltage professionals with an agreed supply capacity higher than 25 kVA and up to 250 kVA. Protergia Business 3 and Protergia Business 3B are addressed to low voltage business customers with consumption needs that vary between night and day.